Illegal online games are being accessed in Vietnam through servers from other countries, and industry observers are warning the country could be flooded with such products from mainland China and South Korea in the near future. The deputy director of an online game publishing company who wanted to remain anonymous said: "It is hard to say exactly how many companies are sending illegal games into Vietnam and how many illegal games are being played. "Only people working in the sector can recognise which is legal or illegal." One of foreign companies that has released illegal games in the country is Koram Games Limited. In an introduction on recruitment website www.timviecnhanh.com, Koram Games says it is an international company based in Hong Kong. It has an office on Hau Giang Street in HCM City's Tan Binh District. It employs between 20 – 50 people, the company says. Vietnamese law does not allow 100 per cent foreign owned companies to directly do business and publish online games in the country. However, Koram Games has launched four online games in the market in the last 12 months or so. According to several online game publishing companies in Vietnam, the markets in China and South Korea have saturated, especially the market for client games and web games. Enterprises in these two countries are thus trying to expand their markets abroad, and Vietnam is a main target because it is the biggest market in Southeast Asia with 13 million gamers. According to Le Hong Minh, general director of VNG, the first company to launch licensed online games in Vietnam, the country's market has great potential because, in the future, 20 million televisions could become game devices and 60 mobile phone users could become mobile gamers. 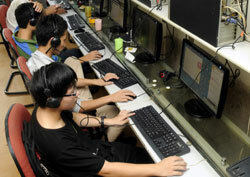 Playing online games on PCs is expected to have a turnover of VND4.6 trillion ($219 million) this year. It could increase 10-20 times in the next eight years, Minh said. Minh also said the "smooth business" that Koram Games was doing, despite its illegality, showed the possibility of a massive wave of illegal games from China and South Korea flooding the country. Because the servers through which the illegal games are accessed in Vietnam are located in other countries, local authorities cannot intervene. Online games are legally published in Vietnam under co-operation agreements with foreign firms, and both sides have to pay taxes under Vietnamese law. But, according to the deputy director, foreign enterprises sending games to the Vietnam market illegally only have to pay 10 per cent commission to enterprises offering payment solutions. This makes it difficult for Vietnamese gaming companies to be competitive, because they are already at a disadvantage in terms of technological development. For instance, the three games that have been published in Vietnam by Koram – www.pvtq2.com, www.3quoc.com and www.tiencanh.com – allow payment with international cards like Visa, Mastercard, or ATM cards. However, since most gamers in Vietnam are teenagers and students who do not have credit or ATM cards, they mostly use cash to buy deposit cards from companies like Viettel, MobiFone, VinaPhone, MegaCard, FPT and VTC. These cards are then used to pay for playing the games. The deposit card issuers have arrangements with intermediary companies that pass on payments to the foreign companies. Vietnamese companies say that if authorities in the country were to ban payment with these cards, illegal games would not be able to dominate the market.